The Helen Miller SEIU Member Education and Training Center was founded in 2007 to provide training for HCIIMK members. Since its founding, over 30,000 union workers have attended training sessions. The assistance with household tasks and personal care that DORS Personal Assistants provide to persons with a disability is critical for them to live independently. PAs bargained and won a paid training program as part of their contract with the State of Illinois. Actively working PAs can earn while they learn life-saving skills, safety precautions and other skills that help them provide better care. Click here to view DORS MANDATORY annual IP trainings in all areas of the state. 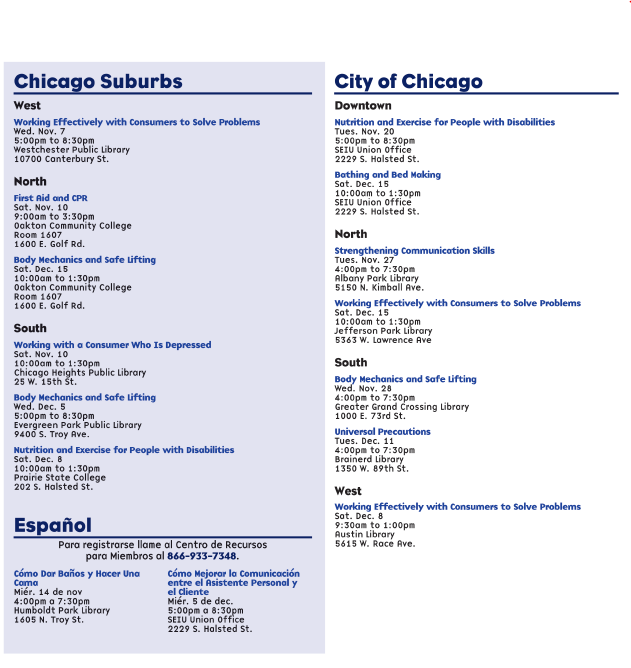 Click here to view DORS VOLUNTARY classes in Chicago & Chicago suburbs. 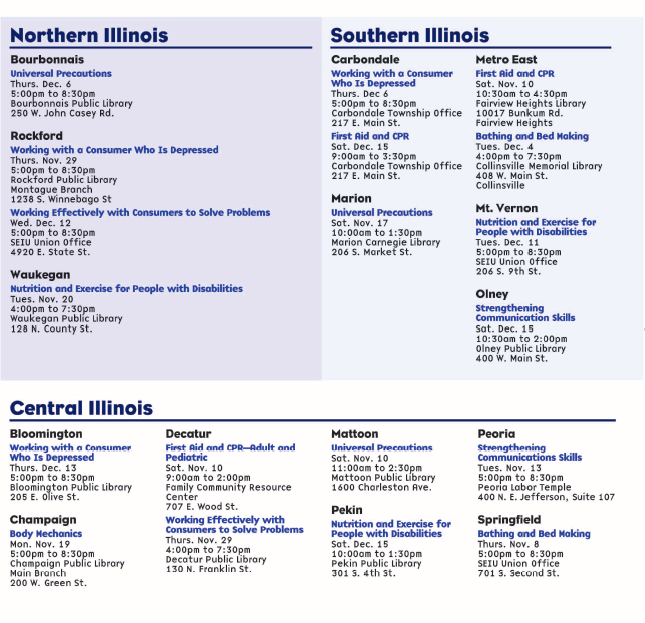 Click here to view DORS VOLUNTARY classes in Northern, Central and Southern Illinois. Click here to register for a DORS class on MemberLink. Family, Friend & Neighbor providers and Licensed childcare providers play a critical role in the care and development of the children in the State’s Childcare Assistance Program. As part of their last contract Childcare Providers won a training program that for most classes, pays them for their training time. All Childcare Providers must complete the CCAP child development, health and safety training requirements by September 2018. Take advantage of the training classes offered by the METC to meet your training requirements. Click here to see the child care training schedules for March and April. Click here to register for a ChildCare class on MemberLink.